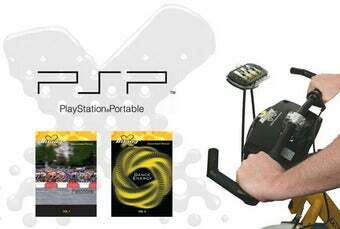 The X-Bike Sony PSP Kit is basically a stand for your PSP that attaches to an exercise bike, allowing you to watch stuff on your PSP while you sweat away the pounds. Finally! It's taken them long enough to figure out a way to allow people to watch stuff while they exercise. Oh, wait, what about just having a TV around? I guess that would make a lot more sense, wouldn't it? Well, for both of you out there who only watch videos stored on UMDs, it's time to start working out on an exercise bike. Just get your $100 ready and get set to make yet another in a long string of poorly-thought-out purchases.